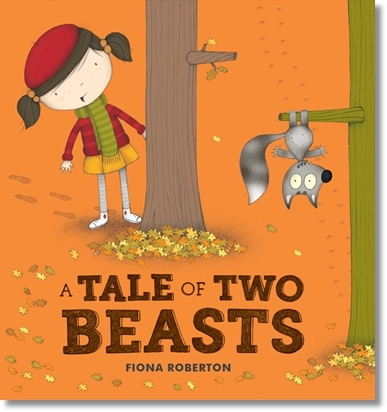 In A Tale of Two Beasts, Fiona Robertson delightfully tells the story of two beasts. One 'The Strange Beast' and the other, 'The Terrible Beast'. The book itself is divided into the two separate stories - each telling its tale and each serving to prove that there are indeed two sides to every story. The Tale of the Strange Beast begins when a little girl walking by the woods spots a strange little creature hanging upside down from a branch and whining sadly to itself. The little girl wastes no time at all and rescues the poor creature; then, calling him 'Fang', she wraps him in her scarf and carries him safely home. The little girl is determined to take good care of the creature so she gives it 'a lovely bath', 'a gorgeous new hat and jumper, and a delicious bowl of fresh nuts.' She even goes to the trouble of making it a house to live in. As if all this isn't enough the little girl takes him for long walks on the end of a lead and shows him off to his friends at school - everyone loves him. The story continues and we witness everything from the side of the little creature. Children (and adults alike) will love seeing the differences in both the text and the delightful artwork which gives this book lots to look and and talk about - making it a great one to share again and again. Sounds delightful - and makes a good point! Thanks, Damian.